(William) Stanley Hogg was born in 1921, and attended George Heriot’s School from 1929 – 1938. He was the elder son of Mr Alexander Duncan and Mrs Margaret Matilda Hogg, 22 Greenbank Loan. Mr Hogg was Session Clerk at St Michael’s. On leaving school, he took a course in Accountancy at Skerry’s College, Edinburgh. Afterwards he entered the Accountants’ Department of the Scottish Provident Institution in April 1939. He volunteered for the Air Force in April 1941, and trained in this country and later in America, where he was awarded his wings as a Sergeant-Navigator attached to Bomber Command. He was killed on active service in January 1943. His chum was Norman Thomson who also made the supreme sacrifice and whose name is also listed here. 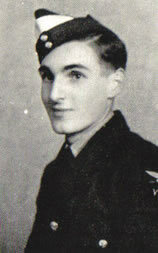 Stanley died at the age of 21 and his name is on the WW2 memorial of St Michael’s Church.